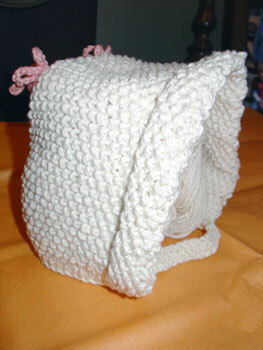 A marshmallow bonnet for Shannon's little one on the way. Pattern is from Itty-Bitty Hats . The yarn is Blue Sky Alpaca's Handspun Organic Cotton, which is even softer than their original organic cotton! It almost makes me glad that Shannon is allergic to wool, so I could use it! This was one of six itty bitty hats that the Knitsmiths made made for Shannon.